ائل دورادو (ایسپانیا دیلی:[el doˈɾaðo]) یوْخسا قیزیل کیمسه یا قیزیل قورتاران آمریکادا موئیزکا ائلی‌نین باشچیسی ایدی. The zipa used to cover his body in gold dust and, from his raft, he offered treasures to the Guatavita goddess in the middle of the sacred lake. 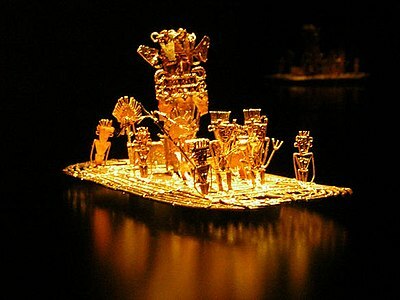 This old Muisca tradition became the origin of the El Dorado legend. Inspection of the Welser army by Georg von Speyer (right) and Philipp von Hutten (center) at سنلوکار د برامدا. بۇ صفحه‌‌ سوْن دفعه ‏۷ مئی ۲۰۱۸، ‏۰۶:۴۹ تاریخینده دَییشدیریلمیشدیر.